Our unique application puts you in full control of your bowls club's website. The majority of indoor and outdoor bowls clubs already have their own website. The problem is, most have to depend on a third-party in order to add or edit the information displayed on the site and therein lies the problem. The third-party may be a club member or perhaps a company specialising in hosting and maintaining websites. In either case, it may not be a simple procedure to keep the website fully updated. It may even have been poorly designed? Well, the Bowls Group application not only provides the very latest in design and technology, but more importantly makes it possible for bowls club committees to maintain their own website! The Master Account holder simply adds other account holders and grants those persons access to only the sections he or she requires. All account holders are able to update their own designated sections from the comfort of their own home, ensuring your members and visitors return regularly to your website, thanks to its ever-changing content. The Bowls Group was founded by Nick Fairall, himself a bowler and former chairman of the Victory Indoor Bowls Club in Portsmouth. Nick's main profession is the development of high-quality website software and his experience at bowls club management lends itself perfectly in the continuing development of this software. 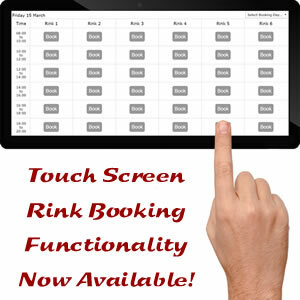 Calendar, Catering*, Coaching*, Competitions, Downloads*, Fixtures, For Sale, Function Room*, Games Room*, Greenkeeping Rota*, History, Homepage, Honours (Ladies), Honours (Men's), Humour*, League Sheets/League Tables, Links, Members Contact Info*, Club News, Officers, Picture Gallery, Prices and Rink Bookings (with Touch Screen option)*. A 12-page comprehensive guide to the many features offered by the Bowls Group Website Application (709Kb, PDF format). The annual subscription is only £239.00, but for a good percentage of our clubs it actually costs them nothing! 43% fully recoup their annual Bowls Group subscription fee by selling all 4 advertising spaces. 15% have sold 3 of their 4 available advertising spaces and have recouped 75% of their annual Bowls Group subscription fee. 29% have sold 2 of their 4 available advertising spaces and have recouped 50% of their annual Bowls Group subscription fee. 13% have sold 1 of their 4 available advertising spaces and have recouped 25% of their annual Bowls Group subscription fee. This means ALL of our Clubs are recouping some, if not all, of their annual Bowls Group subscription fee! Provision is made for you to sell four optional advertising spaces on your website. Approach four local shops (or perhaps ask your membership who run their own business) and offer them the opportunity to advertise on your website. You need charge each advertiser no more than £60.00 per annum in order to fully recoup your annual Bowls Group Subscription. Furthermore, the acquisition and annual renewal of your .co.uk domain name and SSL certificate is undertaken by the Bowls Group, free of charge. "When we decided to go ahead with developing a club website, the project was initially put on hold because of the technicalities we believed we needed to overcome. Only when we were introduced to the Bowls Group did we discover an infrastructure perfectly suited to our needs and after gaining experience through the use of a trial website and with Nick's help, we have now produced a website with which we are delighted to showcase our club." "The Bowls Group website package is excellent for those of us who have neither the skill, inclination or time to put together our own. It has plenty of features designed specifically for bowls clubs including league & competition folders which are all simple to use. One excellent feature is the 'try before you buy' facility whereby you can populate the site and use it as a demo to allow various secretaries to interact with it and for them to be fully satisfied before purchase. There are many other features such as allowing adverts which could pay for the system, all simple to use even for those not totally savvy with computers." "Up until the start of the 2016 season Storrington BC had never had a proper website and i was asked to look into setting one up. Having no experience in this sort of project I took to Google and came across 'The Bowls Group' and this has proved to be the best search on Google I have ever made. The site is so user friendly that anyone with just a small amount of computer knowledge can soon set up their own site. However, if you do need assistance contact Nick at The Bowls Group and his response to you will be very quick indeed. It is so nice to have an expert on hand if you get stuck. We are not a big club but the website has proved so popular that we have had 14,000 hits in the first seven months. So look no further - I believe this to be the best option for any Bowls Club looking to set up their own website." "This application gives your club the ability to keep up to date with club news, league tables, competition results, club calendar and more. It will give you a clean uncluttered site that is easy to maintain and a pleasure to use. Should you need help with any aspect of setting up or maintaining your site, Nick Fairall will respond quickly and efficiently. Nothing is too much trouble for him and if I could give his application a rating it would be 5 stars." "We have discovered that even with our limited abilities we are able to develop and maintain our Club website ourselves. We are in full control without the help of expensive third parties. It's a genuine win win!" "I was foolish enough to suggest that Tiptree Jobserve Bowls Club should invest in a website, and of course, before I knew it I was tasked with getting it sorted. I have absolutely no experience of setting up a website, but with the aid of Google I found the perfect solution. I had discovered The Bowls Group, and its proprietor Nick Fairall. The company provides everything a complete novice, like me, needs to get a bowls website up and running. With the brilliant support of Nick, who is always eager to resolve any technical difficulties, we now have an excellent web presence. Our members love being able to see match results and club announcement on-line." "As a club, Falaise decided that our old website was in need of a long-overdue update and the job of updating or finding a new design fell on my shoulders. After extensive research and talking to various other designers, I came across the Bowls Group Website. I decided to take up the offer of the 'take-as-long-as-you-like' trial period and started to have a good play around whilst also looking at the design of the other clubs already signed up to the Group. I took the idea to our Board of Directors and the decision was made to go ahead and sign up to the Bowls Group. I can honestly say that the developer of this app, Nick, has been there whenever needed and with his help and input I feel that we are beginning to put together a very good looking website. I cannot praise him enough for creating this excellent and easy to use application that is not only easy to update but very affordable also. I would recommend that if you are looking to update or change your existing bowls website, give the Bowls Group a try before you buy." This is a short list of our most frequently asked questions. For more information about The Bowls Group Website Application, please contact us. As long as you like. There are many areas of your club website that you will want to complete before going live but when you're ready, your preferred .co.uk domain name will be acquired and your club logo will replace the Bowls Group trial logo. Will the website work across all browsers? Yes. Your Bowls Group website will be delivered from our own high-speed virtual server, maintained by one of the world's leading providers of Internet access and hosting services 'Fasthosts'. It will also conform to W3C HTML5 validation, ensuring full cross-browser compatability on the largest of desktop computers down to the smallest of mobile phones. Is the website responsive (i.e. mobile-friendly)? Fully, both the website pages and administration area. And in addition, members of subscribed clubs can download the Bowls Group Smartphone App from Google Play or the App Store and view their club competitions, fixtures, league tables, news, calendar and picture gallery! You will see from the testimonials that our response is fast, most often within the first hour. Any technical issues will normally be resolved within a few hours at the most. Will our website be found on Google? Yes. We are confident that if somebody was to search for bowling related activities located within your county, you will appear on the first page of Google. Almost certainly the top position. Will there be a hit-counter on our website so we can see how many people are viewing it? No, they really are old-hat nowadays. However, we set up Google Analytics (the freemium web analytics service offered by Google) for all subscribing clubs. This provides in-depth website traffic data. If we decide not to renew, can we keep our domain name? Yes. The domain name we acquire for your Bowls Group website will be released to you if you so wish. Complete the following form to request a free, no obligation trial - you'll be configuring your website within minutes! Welcome to The Bowls Group User Agreement. This Agreement is a legal document which sets out your rights and obligations in relation to the services offered by The Bowls Group. This Agreement shall be effective from the date of accepting this agreement and continuing until it is terminated. This Agreement may be revoked or terminated by The Bowls Group at any time at its sole business judgment. The Bowls Group may terminate this Agreement immediately or suspend the User's access to Services upon any breach of this Agreement by the User, including but not limited to, refusal or failure to pay for Services, or by sole judgment of The Bowls Group that the User may be performing activities harmful to The Bowls Group or its other Users, employees, vendors, business relationships or any other Users of the Internet. The Bowls Group may terminate this Agreement without cause immediately upon breach of this agreement. The User may terminate this Agreement by allowing the agreement to expire. The Agreement terminates with each subscription period or count. Resubscribing to the Service binds the User to the Agreement in effect on the date of renewal. The right to use our service is subject to the purchasing of a subscription fee. This fee is to be paid on a recurring basis when your subscription period has expired. Payment must be made and charges cleared before Service may begin. Refund Policy: Subscription Fees are refundable only in exceptional circumstances, and at the sole discretion of The Bowls Group. You are therefore recommended to familiarise yourself with the The Bowls Group site before paying a Subscription Fee. If you are in any doubt as to the benefits of becoming a Subscriber you should ask for clarification before paying the Subscription Fee. To the extent that the law permits, you release The Bowls Group or any website linking to and providing a gateway to our site, its agents and employees from all liability arising out of or in connection with the use of our services. The Bowls Group shall not be liable for any failure to perform its obligations under this Agreement caused by matters beyond its reasonable control. This website is owned and run by The Bowls Group. Nothing in this Agreement is intended to limit or exclude any liability on the part of The Bowls Group where and to the extent that applicable law prohibits such exclusion or limitation. In particular, if you are a consumer YOUR STATUTORY RIGHTS ARE NOT AFFECTED. This Agreement shall be governed in all respects by the laws of England and Wales and the courts of England and Wales shall have exclusive jurisdiction to any dispute relating to this Agreement or use of the website. We do not guarantee continuous, uninterrupted or secure access to our services, and operation of our site may be interfered with by numerous factors outside of our control. If any provision of this Agreement is held to be invalid or unenforceable, such provision shall be struck and the remaining provisions shall be enforced. Headings are for reference purposes only and in no way define, limit, construe or describe the scope or extent of such section. Our failure to act with respect to a breach by you or others does not waive our right to act with respect to subsequent or similar breaches. This Agreement sets forth the entire understanding and agreement between us with respect to the subject matter hereof. The Bowls Group are committed to protecting your privacy. We use the information we collect about your Club soley for the purpose of providing you with a Bowls Group Website. You may be asked to specify whether you wish, or do not wish, to receive marketing, promotional or other communications from The Bowls Group, businesses with which we have established a commercial or marketing partnering relationship, or other third parties. We may retain information about the Transactions you enter into through The Bowls Group Services, including the subscription paid, the method of payment, together with related contact and billing information. Cookies are small pieces of information in the form of a text file that a website can put on your hard drive in order for it to remember something about your site visitors at a later time. Cookies are used on almost all websites. The Bowls Group Application uses a small number of cookies for identifying user behaviour with the aim of providing visitors to your Bowls Group website with the best browsing experience we can. 1. To make the website work in the way you and your website visitors would expect it to. 2. To continually improve our application. 3. To remember certain settings in order to make your website visitor's next visit a more pleasurable experience. Our cookie information does not include any personal data such as name, email, address, telephone number. We may retain emails, text messages and letters sent to The Bowls Group.